Woodman, Arbus and Mapplethorp are three names I have rarely heard being mentioned together. To some extent, I feel a little ashamed for saying so – but Mapplethorpe, I must admit, was a name I knew least well. For many, Francesca Woodman, Diane Arbus and Robert Mapplethorpe are three of the twentieth century’s most influential photographers. The exhibition I visited today in Edinburgh’s Scottish National Portrait Gallery was both insightful and thought-provoking. The exhibition aims to …Explores the connections and similarities between these three Americans, each of whom produced bodies of work that were revolutionary, ground-breaking and at times controversial. 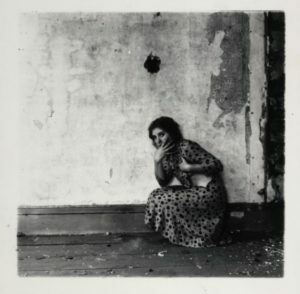 Upon entering the gallery, we are first greeted by the work of Francesca Woodman. Although I have admired the work of this photographer since I first became aware of her work, I had never researched her work – or her biography. What I found most intriguing was that she started exploring self-identity through photography at the age of 13, and that she continued to experiment and develop her practice, until her suicide at the age of 22 in 1981. With many of her prints being untitled, her subject matter seems to be an exploration into her own psyche. The images were very much thought-provoking and insightful. Diane Arbus made most of her photographs in New York City, and best known for photographing people who maybe considered to be on the fringes of society, creating among the most intimate, surprising and haunting works of art of the twentieth century. The final series of portraits of Robert Mapplethorpe explores the photographer’s varying personas, as expressed for the camera, and poignantly document his declining health as a result of having contracted AIDS. If any of you have the time to visit an exhibition of either Woodman, Arbus or Mapplethorp, I would certainly encourage it. Not just as a day-out to look at photographs, but as an opportunity to look at ourselves.